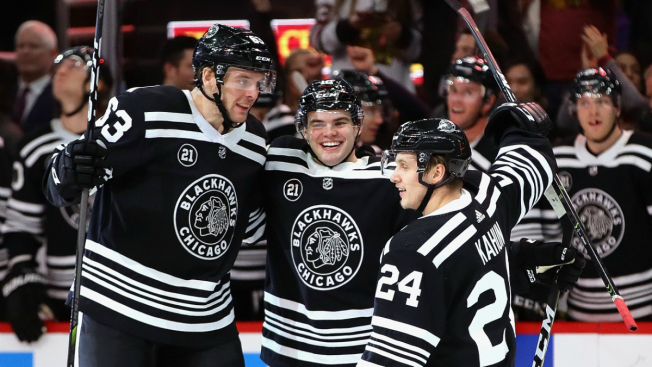 Alex DeBrincat #12 of the Chicago Blackhawks (center) celebrates his hat trick with teammates Carl Dahlstrom #63 (L) and Dominik Kahun #24 against the Ottawa Senators at the United Center on February 18, 2019 in Chicago, Illinois. Alex DeBrincat had the best game of his career, and the Chicago Blackhawks needed all of his production. DeBrincat had three goals and two assists, and the Blackhawks held on to beat the Ottawa Senators 8-7 on Monday night for their ninth win in 11 games. The five points for the 21-year-old set a career high, and his fourth NHL hat trick gave him 32 goals in his second season. "High-scoring affair, obviously," DeBrincat said. "It's a pretty crazy game, more like a summer hockey game. But we got the win so we'll move on from here." 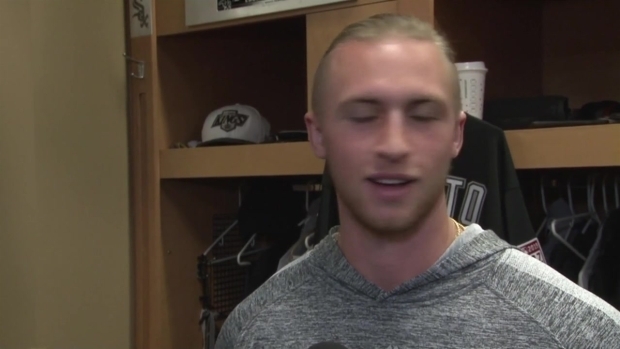 White Sox pitcher Michael Kopech had some HUGE praise for outfielder Eloy Jimenez. DeBrincat continues to thrive on a line with Dylan Strome, his former juniors teammate. He has six goals and six assists in his last six games and points in 11 of his last 12. "They're giving me the puck a lot in each game, so all I have to do is bear down and put it in the net," DeBrincat said. Patrick Kane scored his 36th goal and added two assists to extend his point streak to 18 games — with 14 goals and 26 assists during the stretch— the longest by a player in the NHL this season. Strome also had a goal and two assists in his fourth three-point game since joining the Blackhawks on Nov. 25, and Brandon Saad, Gustav Forsling and Jonathan Toews also scored to help Chicago move a point behind Minnesota for the second wild card in the Western Conference. 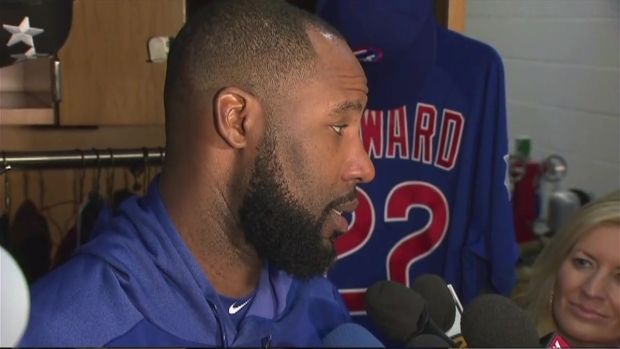 Cubs outfielder Jason Heyward speaks to media in Mesa as spring training gets underway. The wide-open game might have been entertaining, but Blackhawks coach Jeremy Colliton disliked the sloppiness. "I didn't particularly enjoy it back there (behind the bench)," Colliton said. "It wasn't pretty defensively. ... The good news is we won when we maybe didn't have our best effort. We found a way." 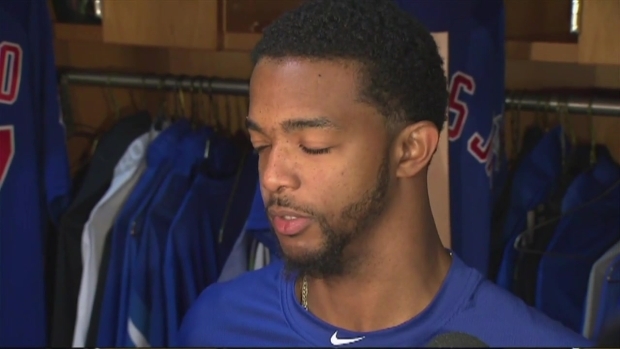 Carl Edwards Jr. speaks to media as Cubs spring training opens in Arizona. "I've seen a lot of weird games, and that's one of them," Ottawa coach Guy Boucher said. "It's definitely not one of those games you spend a long time watching video on." The Blackhawks led 5-4 after a wild first period loaded with defensive breakdowns and few soft goals. Both starting goalies — Chicago's Collin Delia and Ottawa's Anders Nilsson — were pulled before the end of the period. "Nine goals in one period, I think that's the first time I've ever seen that," Chabot said. Cam Ward got the win as he finished with 24 saves on 28 shots. White's second goal, on a wrister from the left circle, tied the score 1:32 into the second. DeBrincat completed his hat trick on a screened one-timer at 8:19 to put Chicago back ahead. Forsling ripped in a screened slap shot from inside the blue line 1:12 later to increase the Blackhawks' lead to 7-5. Set up by DeBrincat, Toews whipped in a power-play goal at 3:51 of the third to give Chicago a three-goal lead. Chabot scored from the left wing at 9:01 to make it 8-6, then buried a rebound with 5:17 left to pull Ottawa within a goal. Chicago then killed an Ottawa power play over the last 1:40 with the Senators' Craig Anderson pulled for an extra attacker. Ryan had a power-play goal and Balcers scored even-strength 34 seconds apart to put Ottawa up 2-0 just 2:40 in. DeBrincat tied it at 2-all just 2 1/2 minutes later with a power-play goal and an even-strength tally of his own in a 1:13 span. White's first goal put the Senators back ahead 3-2 at 7:55 and chased Delia, who faced 10 shots. Kane and Strome connected 46 seconds apart to put Chicago ahead 4-3 with 6:38 left, prompting Boucher send in Anderson. Nilsson gave up the four goals on 12 shots. Anderson, who had missed the previous three games with an eye injury, allowed four goals on 30 shots. Saad was wide open at the edge of the crease for a tap-in with 5:07 left in the first to made it 5-3, then Stone scored countered from the slot with 2:14 left to pull Ottawa within one. NOTES: Kane has assists in 17 straight games, matching Wayne Gretzky and Paul Coffey for the third longest assist streak in league history. Only Gretzky (23 games in 1990-91) and Adam Oates (18 games in 1992-93.) have had longer such streaks. ... The nine goals by both teams in the first period set a Senators team record for combined goal in a period. ... Chicago made a minor-league deal before the game, acquiring F Peter Holland from the New York Rangers for D Darren Raddysh. ... The Senators are rumored to be shopping pending unrestricted free agents F Matt Duchene, D Stone and F Ryan Dzingel as next Monday's trade deadline approaches. Scouts from no fewer than nine other NHL teams were in the press box, including two from Winnipeg. Senators: At New Jersey on Thursday night. Blackhawks: At Detroit on Wednesday night.